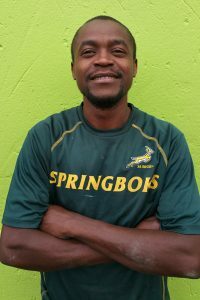 Meet Frans Matlhwana. A man of many talents who is as dynamic as he is cryptic. Frans is an accomplished paint mixer and spray painter. His keen eye for accurate colour matching and mixing makes him one of the very few with his adept craft in the panel beating industry. His story mimics an emotional drama with gut wrenching highs and lows that can keep an avid movie goer at the edge of his seat. Frank Menezes, founder and executive manager of Metal Cross Vehicle Makeover Clinic, recalls many a man hour of intense discussions with Frans ranging from calming his emotional outbursts to structured leadership and personal, career development pep talks. But it has not been in vain. “I owe the last 10 years of my life to Frank. He raised us like his own children. We were all young and without any experience when we joined him,” says Frans. “I can trust him with my life. Even when I have personal problems I know I can talk to him,” he says. His metaphor refers to an opportunity which Metal Cross’s executive management has created and offered one of its longest serving employees in celebration of its 10 year anniversary. The official hand over is on the 3 March 2017. Frans has been trained and provided a mobile panel beating unit that will see the beginning of his own Panel Beater business, FPDM Mobile Scratch and Dent Repairs. He will be mentored and coached by Frank in this new venture. As a seed to the new mobile panel beating business, Metal Cross family held an official hand-over ceremony where the rain started drizzling, in what was seen as a sign of blessing. 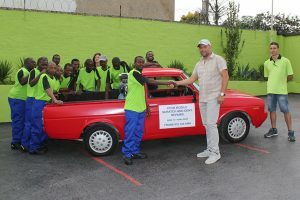 An emotional Frans received a Toyota bakkie fully equipped with scratch and dent equipment and stock which was celebrated by employees and clients. Asked if he was nervous he said he was too excited to be nervous. Besides, he said in conclusion, I’m ready for my next challenge. developed by: marcellosabbioni. All rights reserved © 2019.